for shipping quote estimates through the postal service. You pay exact shipping and Customs fees in your country. We accept MC, Visa, Discover, American Express and Paypal payments. Our Paypal address is kmalone@dollery.com . All sales final. No refunds, exchange or merchandise credit on sale dolls. Not applicable to any previous sale, layaway or order. No exceptions. Not applicable to any secondary market merchandise, special collections and certain one of a kind dolls. Kish, Baloo & Little Mogli, Was $270- Now $99.00 set - Take an ADDITIONAL 20 PERCENT OFF! Sarah Niemela, Nora, 1/k sleeping baby, orig. $1800 now $450. - Take an ADDITIONAL 20 PERCENT OFF! Linda Kertzman, Plusczok Patti in Washington - $139.00 - Now $69.00! - Take an ADDITIONAL 20 PERCENT OFF! 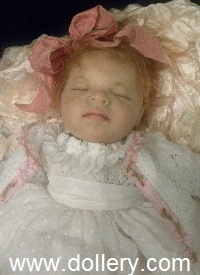 Karen Alderson, Child doll was $2,400 - Now $600.00! - Take an ADDITIONAL 20 PERCENT OFF!